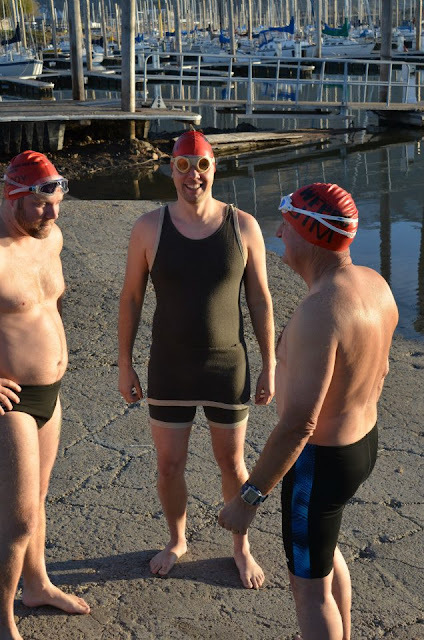 I met Goody, Gordon and Jim at the GSL Marina yesterday afternoon for the second swim of the year with WFPBC. We also had a good group of spectators: Sabrina and my three boys, Chad and Cathi. The water was 57 degrees, which was about the same as last week. It was cold at first, but not bad after I got used to it. My new (old) swim suit and goggles. I bought a vintage one-piece wool bathing suit last week and decided to take it for a spin. I didn't notice as much drag as I expected but that was probably because the vintage goggles I was wearing kept filling up with water, stinging my eyes, about every 10 strokes. After a while I just switched to breaststroke and took the goggles off. I noticed some hot spots with the suit that I am going to have to grease up for longer swims. After swimming out to the rocks, we turned around and headed back. As we were coming back there were three row boats coming out of the marina. We found out they are from the Waterford School in Sandy. Goody is a great cold water missionary and invited each kid to come and swim with us next week. It was a good time as usual. I spent just under 20 minutes in the water. We found out Chad is going in for shoulder surgery today and I wish him the best and hope that it doesn't keep him out of the water too long. Jim brought a bag of goodies that we will be giving away at the SDRC meet this weekend along with some GSL swag and a brand new tandem kayak that Gordon scored. The next WFPBC swim will be next Tuesday at 4:30pm. Come and swim with us and start working towards earning your cap.